The Automobile Journalists Association of Canada (AJAC) awarded Best New Innovation Technology for 2017 to Mazda for its G-Vectoring Control. 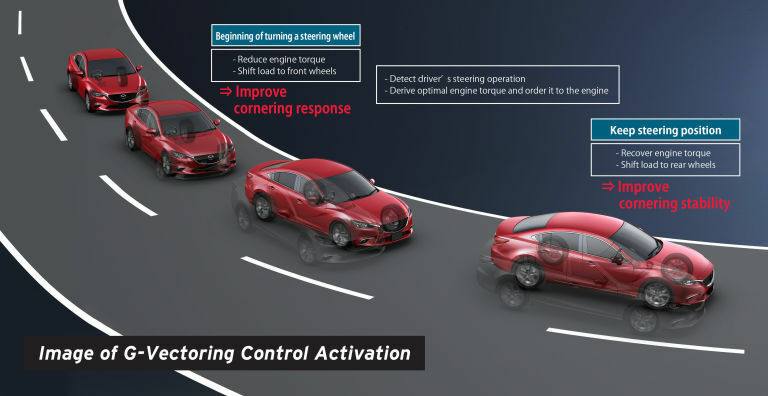 Starting with the recently introduced 2017 Mazda6 and Mazda3, Mazda introduced a series of new-generation vehicle motion control technologies called SKYACTIV-VEHICLE DYNAMICS. The first technology of this series is G-Vectoring Control, or GVC. In a nutshell, GVC is a technology that uses the engine to enhance chassis performance. GVC adjusts engine torque in response to steering action, delivering unified control over acceleration forces. Optimizing loading for maximum grip from each tire means the car moves more precisely as the driver intends, reducing the need for steering corrections, including many that the driver is not even aware of. On slippery road surfaces, steering response and handling stability are improved. G-Vectoring Control is included as standard equipment in the 2017 Mazda3 and 2017 Mazda6.